iSpeak Cloud: Crossing the Cloud Chasm uses a creative workshop approach to enable Enterprise IT to create a cohesive cloud strategy for reigning in Cloud Stall & Sprawl. Join Universal Kingdon Financial Services as they struggle through solving the many challenges presented in today’s IT on their overall journey to taming the Hybrid Cloud Hydra. 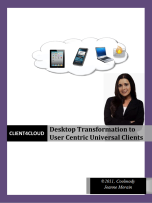 Client4Cloud is the first and a unique book that covers universal clients, the next step in application and desktop delivery. Jeanne Morain succeeded in creating a valuable must-read for IT professionals who are in the process of investigate end-user computing concepts and solutions. This book is the shortcut guide to user-centric computing. Visible Ops Private Cloud presents a four-phase approach for managing the development and rollout of a private cloud. It was written with and created for enterprise IT executives and datacenter managers who are responsible for the success of private cloud initiatives.